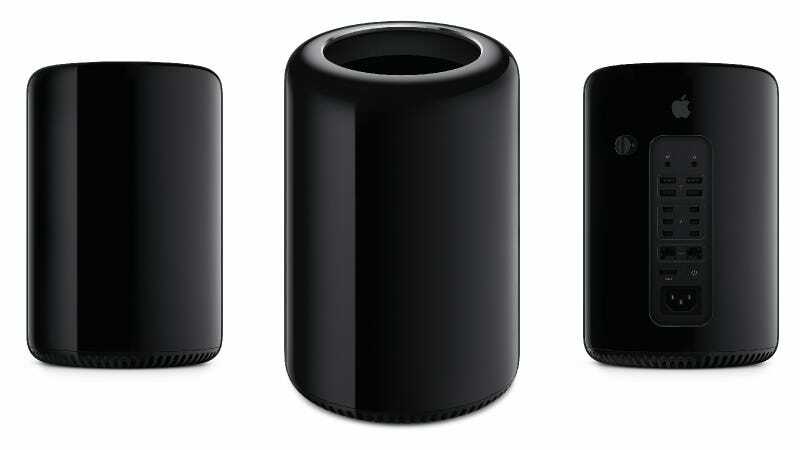 Today during the WWDC keynote, we got our first look at what Apple is thinking in terms of the future of Mac Pros. Everyone who said the Mac Pro is dead can just shut up. Here comes a new freaking generation of high-performance computing from Apple, and we couldn't be more excited. The new Mac Pro will support up to 12-core configurations. They've got the fastest ECC memory the company has ever put into its computers, which is clocked at 1866MHz DDR 3. For I/O, the new Mac Pros will support (of course) FireWire, and the brand new Thunderbolt 2 standard. There will also be AMD FirePro graphics capable of running up 4K out of all of its ports—up to three UltraHD displays simultaneously. These are full-on professional machines for current pro users. Apple's demoing Pixar animation this week, running on these machines. Doesn't get more taxing than Pixar. And of course if you're looking at this thing, you can tell it looks different than the old aluminum boxes we're used to looking at. It kinda looks like a giant trashcan! But the new circular design means the new beasts are 1/8 the volume of the last iterations, while still allowing easy access to the guts for breezy-fast hardware upgrades. Further details are scarse, but we do know two things: They're made in America, and available later this year.